Woohoo! I did it. 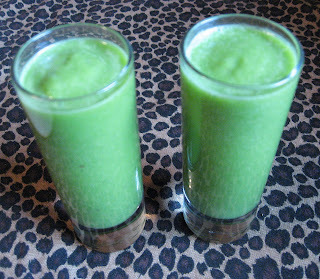 Today is the tenth day of my personal green smoothie challenge with at least one green smoothie a day for ten days. I notice increased energy and I'm walking several times a week, which I've not been motivated to or able to do in a very long time...and I'm loving it. Have I lost any more weight this week? Sadly, no. I really thought I would, but I feel an incredible shift in my physical body. I have issues with Adrenal Fatigue and produce too much cortisol. Cortisol turns to insulin, and insulin to belly fat! It's a viscous cycle. The body doesn't know the difference between physical stress or emotional stress and therefore, when your adrenals are shot, your body goes into fight or flight and revs up the cortisol. When I start to exercise at this point, I usually gain weight. Trust me - It's NOT muscle. I'm 205 pounds right now. I've got a lot to lose, and walking 1 or 2 miles a day, is not going to produce enough muscle to make me gain weight, when I have so much more fat to lose. It's the Adrenal Cortex Curse!! That is what I'm working on. I truly believe that when my body heals (that's a process, not overnight), the weight will come off and my Interstitial Cystitis will be gone. AMEN! So I've completed my first ten green smoothie days. I feel better and am more energized. W feels better and is enjoying his green smoothies. We will continue to drink daily green smoothies and I'll report in on my progress. (Check the Day to Day section of my blog) Wish me luck! Rainy, damp day called for a hearty smoothie. 1 each - Swiss chard and kale, 2 celery stalks with leaves, bunch of dandelion leaves, (threw in some leftover salad greens), flax seeds (ground), apple, pear, dates. Repeated yesterday's smoothie. Took a nice long walk in the rain. Fabulous!